The Baugher family has been farming for many generations. Chris and his wife Marcie knew that moving to organic farming was their calling. In 1984, Chris and Marcie held on to a 40 acre almond orchard with everything they had and started Baugher Ranch Organics the next year. Almost 30 years later, their farm and processing facility in Northern California has become the leading producer of organic almonds. With four generations working together side by side on the farm, ‘organic’ has become a way of life for the Baughers. Today, their daughters Nisha and Rania and son Bradley all live and work on the farm. For them, organic farming and processing is beyond certifications and is really about embodying organic principles. Through cover cropping, water conservation, promoting biodiversity and other practices, they hope to give back to the land and provide something better for future generations. And although the lifestyle has been physically, mentally, and emotionally challenging, at the end of the day, they find it brings tremendous joy and is deeply rewarding. To learn more about Baugher Ranch Organics, visit their website. Farming is in the Lesters’ roots. Born and raised in the Valley of the Heart’s Delight (now known as Silicon Valley), like many generations before him, Russ Lester grew up working in his family prune orchards. It wasn’t until his college chemistry and botany courses that he realized the potential harmful effects of chemical herbicides, fertilizers, and pesticides. In 1979, Russ decided to follow in his father’s footsteps—he and his wife bought a 69 acre dilapidated almond orchard in Winters, California and started converting the orchard to walnuts. Unfortunately, it was a tragic wake-up call that convinced the Lesters to stop using agrochemicals. Russ’s father was diagnosed with Non-Hodgkin’s Lymphoma, and around this same time they learned of a study linking this type of lymphoma to herbicides used in conventional farming. The Lesters decided for their young family’s health to transition to organic farming. They switched to using no-till cover crops, integrated pest management, composted manure, a more efficient sprinkler system, recycled packaging, and put solar panels on their buildings. 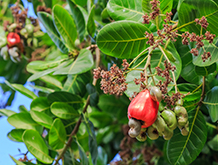 And to reduce their energy use, the Lesters found a way to turn their leftover walnut shells into electricity and gas which goes back into the process of drying and processing their walnuts. 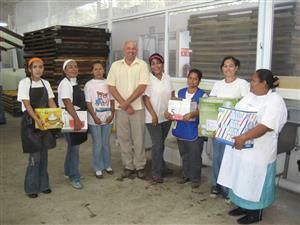 Through these efforts, they have cut costs while reducing their environmental footprint. Each year they learn and improve the whole-systems approach they started over 30 years ago, always working towards becoming more sustainable. 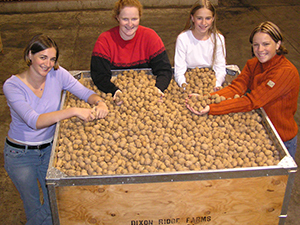 To learn more about their walnuts, visit the Dixon Ridge Farms website. Fruit d’Or is a leading supplier of organic berries, but remembers its small town roots in organic farming. Founders, Martin Le Moine and Marcel Pilotte started Canada’s first organic cranberry farm in 1993. They also helped pioneer organics in Canada by working with ECOCERT and others to build organic certifications. 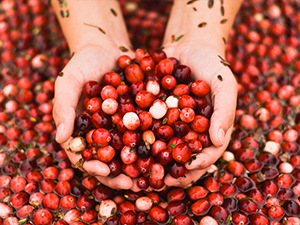 With no market for organic cranberries at the time, they switched their focus to processing. By making a variety of berry products, from dried fruits to juices, they could make organic options more available for the public. Today they work with over 25 growers and specialize in organic cranberries and blueberries. As the company grows, they aim to never lose sight of their sustainable principles. They’re always reminded of this during weeding season. Although it’s not pleasant to remove weeds manually when it’s cold, wet, dark, and muddy, it’s worth skipping the quick-fix chemicals. Fruit d’Or supports their community by participating in more than 100 sporting and cultural events. They’ve even had their cranberries launched into space with astronaut Chris Hadfield! With their growth, they hope to continually make organic foods more accessible. Visit Fruit d’Or for more information. 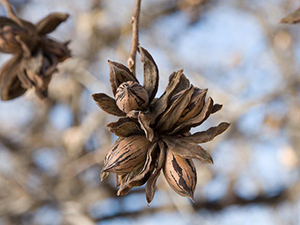 The Green Valley Pecan Company’s story began in 1946 when Keith Walden realized his childhood dream of purchasing a farm. In 2000 the farm’s manager felt that organic would be an important direction to head in, so they started trying out organic farming methods: practices include water conservation and recycling nut shells to create compost. They are also trying to incorporate legume flooring crops to minimize the effects of pests like green and black aphids. They believe in giving back, providing employee benefits, and donating land to build a high school, housing, and a future hospital. These actions have resulted in lasting ties, with 4th generation employees still dedicated to working on the farm and in the processing plant. At the end of the day, as a farm and processor, the Walden family is proud of seeing a quality product through from earth to package. Visit Green Valley’s website for more information. 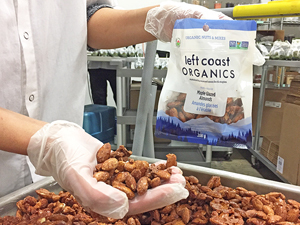 For over 20 years, Left Coast has been supplying retailers across Canada with premium bulk organic nuts, dried fruits, seeds and snacks. Our products have always been sustainably sourced directly from farmers and partners here at home and around the world. Now we’re offering the same delicious products packaged by us for you and available in stores across Canada. We aren’t new to the world of packaged food though. Since 2009 we have been making our Hippie Snacks line of delicious whole food snacks and granolas (you should try them too – they rock). As a certified B-Corp (Benefit Corporation), we’re proud to be the first in North America to have an official Non-GMO Policy for all of our products. We strive to use business as a force for good in society—because we believe food grown and made right can make a difference. For over 30 years, the old-fashioned traditions of hard work, integrity and service have been the ingredients of success for the Sowden Bros., an organic farming operation that grows certified organic prunes in the heart of the Sacramento Valley. The Sowden brothers, Buzz and Budd are first generation farmers and work side by side together on the farm. In 1976, they bought a 25 acre prune ranch in Southern Butte County. This was their start. Today they farm is nearly 350 acres of organic prunes near Live Oak, California. Live Oak is a small town just east of the Sutter Buttes, 60 miles north of Sacramento. 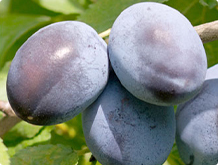 All of the prunes they grow, buy, and process are certified organic by QAI. To learn more about Sowden Bros., please visit their website. For the past 27 years, Tid Bits has partnered with organic farmers across Mexico to curate tropical fruits. They specialize in dried mango, pineapple, banana, papaya and jackfruit, working with hundreds of organic producers with land spanning over 700 hectares. The company continues to grow but its founders have not lost sight of their commitment to benefit the communities they partner with in Mexico. They are involved in building local cultural centres, improving community recreational facilities, and repairing a town’s drainage system. They are especially passionate about providing annual scholarships for youth to attend university, and about creating a fund to make medical care accessible for their workers. Everything, from using approved organic farming methods to supporting communities, is part of Tid Bits’ vision to maintain the planet for a better future. 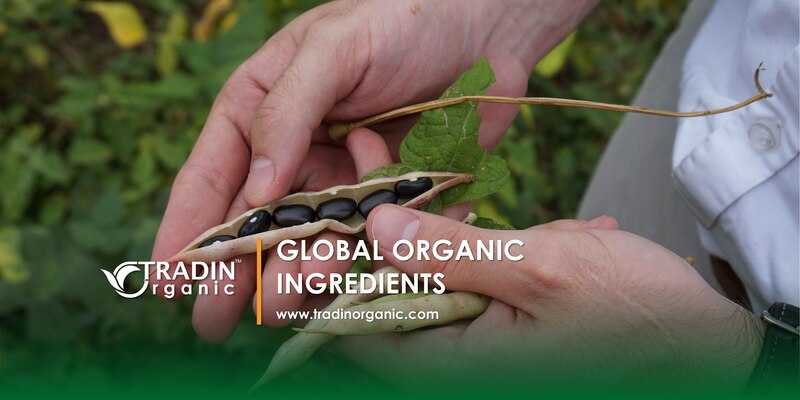 Tradin Organic has partnered with organic producers that know organic farming is healthier for themselves and for consumers. They are committed to organic because it is environmentally friendly, fosters biodiversity, and provides work opportunities and better incomes for the villagers of the area. For the farmers, it feels good to know that they are providing people with food that is organic. As well, working with the soil, plants, and nature helps them to feel that they are a part of it. By adhering to organic farming methods, that avoid pollution and work to achieve a natural balance, they have been able to preserve the region’s biodiversity, respecting the lifecycles of its organisms, insects, butterflies, and birds. They choose organic agriculture because, unlike conventional methods, it considers the future as it works towards sustainability. To learn more about their mulberries, visit the Tradin website.